Everyone who works at Sunset Hill Stoneware has incredible talent and skill. This might seem like an obvious statement—after all, potters make our handcrafted custom stoneware on pottery wheels. But, our crew's talents go far beyond what you can pull out of a kiln. Meet Jordan Johnson. 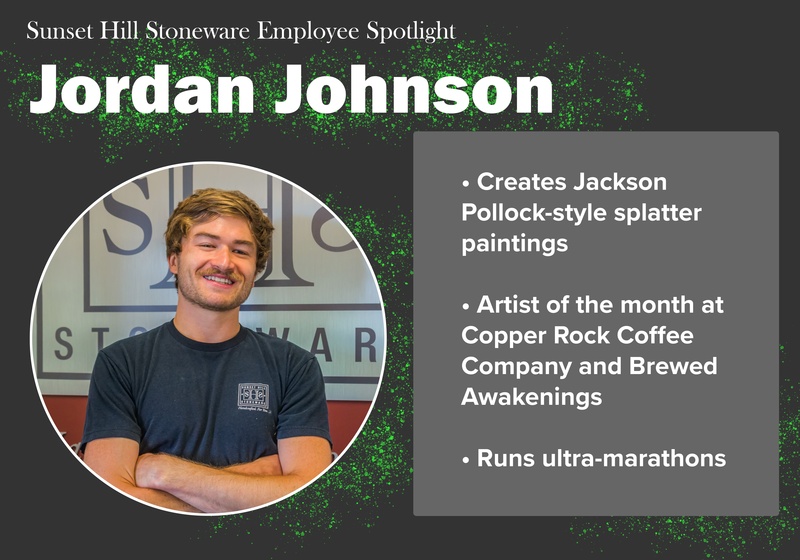 He started working at Sunset Hill Stoneware in December 2016, making 2018 his second full year here. By day, Jordan works in our shop's prep and finish stations to make sure every custom stoneware mug is up to our rigorous standards. 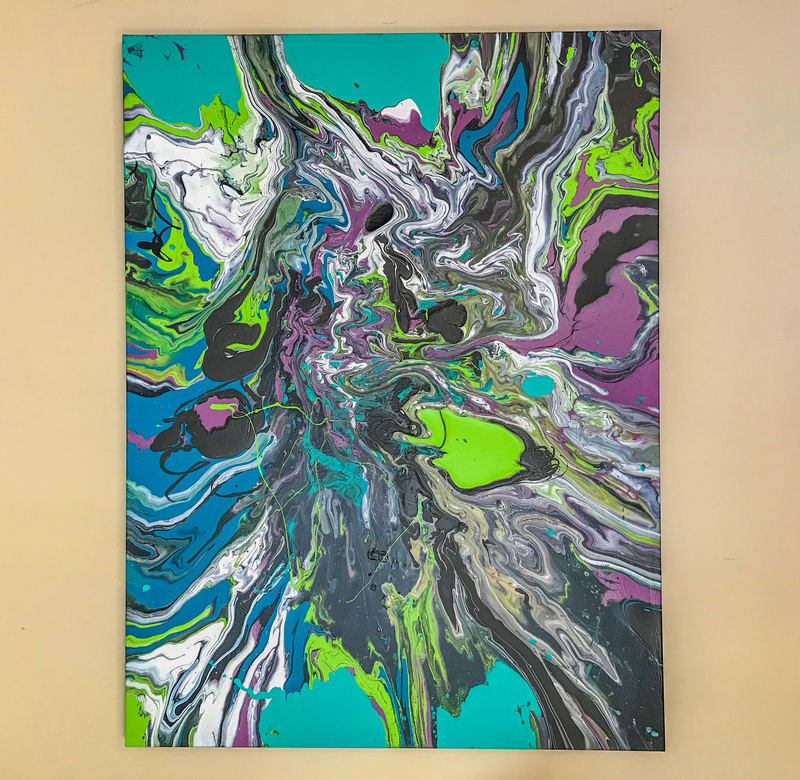 After hours though, he creates drip paintings that are found all around the country and highlighted in coffee shops around nearby Appleton, Wis. like Copper Rock Coffee Company and Brewed Awakenings. Jordan first took up painting when he was 23 years old and working at Waupaca Foundry. Working second shift until 10 p.m. for six years left him looking for a hobby he could turn to while he wasn't at work. "I had these ideas of Jackson Pollock-style artwork, but I didn't want to copy him, and I wanted more vivid color," Jordan said. "So I just started experimenting in my basement and it led to doing that at three in the morning for quite a while, and then I slowly crafted what I wanted out of it." Over time, Jordan's art began to capture the public's attention to the point where he was able to sell it to art lovers around Wisconsin. He had no formal education in art, although he'd long been interested in abstract artists like Mark Rothko and Frank Stella. "I always had this creative mindset to do it," Jordan said. "I always took art classes, but I didn't pursue anything outside of high school." Some painters are very particular about the supplies that they use, even paying top dollar for certain name brands. Jordan, on the other hand, has a slightly more resourceful approach when he's getting supplies for a new painting. "I would do this thing where I would go to all the paint stores and I would buy all the missed paints, because they were cheap," Jordan said. "I'd get canvas for cheap then too, and I'd just scrap together all this stuff and that way it would cost less and I could still get the job done properly." To this day, this is still an important part of Jordan's process when he creates a new painting. "Like, this red isn't perfect and this white is slightly off, but it'll work for what I'm doing," Jordan said. Despite not using the highest-quality or most expensive paint for his work, Jordan has still created splatter paintings with intricate patterns and unmistakable colors. One of the pieces of which he's proudest, Aether, features a galaxy of cool colors bleeding out from the center in a pattern reminiscent of a nebula forming in the depths of space. "I like taking a black hole-esque color scheme, with purples and blues and lime greens and pink and black and white," Jordan said. "I just had this month where everything I made was perfect... and I'll never sell (Aether). It's in my living room." 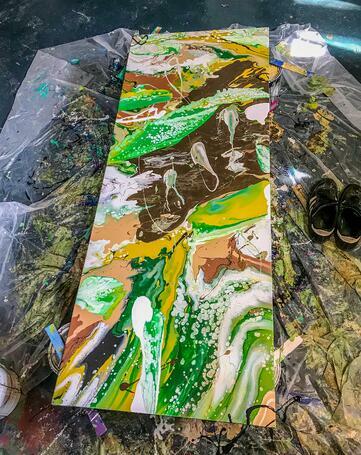 Another painting he has done, Natural Disaster, features a hurricane of earth-toned colors like green and ocher and yellow raining down the edge of the canvas. The process of creating these drip paintings is mostly enjoyable for Jordan. The only issues he faces are paint fumes, and the occasional customer who commissions him and is very particular about what they want. "A woman called me and I went to her house, and she wanted a piece above her fireplace," Jordan recalled. "It's a very natural, earthy-looking one, and she was really tough to work with, but the outcome was one of my favorite pieces. Just the struggle to get to that was very challenging." Aside from Pollock, Jordan draws influence from current artists like Vanessa Prager, who lives in Los Angeles. She is known for her abstract oil paintings that look like a chaotic array of smeared layers of paint up close, but when viewed from a distance they resemble a human face. "It's hard to see, but she can really just create something out of that," Jordan said. Artists often have different sources of inspiration when they work. In some cases, it's from their environment or people they see as muses. In Jordan's case, he always listens to a different album or artist with each piece he creates. After completing each painting, he writes the name of the album or artist he used on the back of the canvas. Some of Jordan's customer have even started to ask him to listen to certain albums while he creates their pieces, adding extra challenges and fulfillment to his work. "Originally, when I would get done with work (at the foundry), I was kind of defeated, I was dirty, I was unhappy," he said. "But, I would make that painting and I'd look down and I'd think, 'I created this. This is something uniquely for me that I crafted,' and I get that feeling every time." Thanks to social media and the internet, Jordan's paintings can now be found in Minnesota, Illinois and as far west as Arizona, Oregon and Washington. 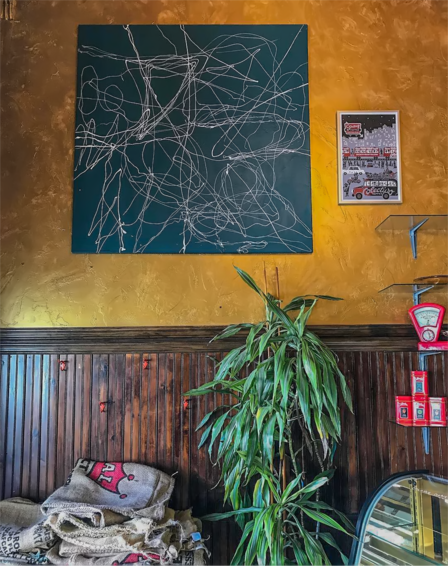 These pieces across America show just how much Jordan has grown as an artist in the five years since he began painting. "I feel like I've honed in on what I wanted," he said. "I experimented a lot of different ways, a lot of bad color schemes, but I learned." However, some of his goals for his artistic career still have his Sunset Hill Stoneware coworkers' heads spinning. "If I could put a painting on a wheel and spin it as I'm painting," Jordan joked, "That's my next objective." Since Jordan has started throwing stoneware part-time at the shop, he's gotten that same feeling of satisfaction every time he finishes handcrafting new mugs. He mainly works the prep and finish stations at our shop, sanding and stamping the bottoms of our stoneware, but he has started throwing mugs in the afternoon and helps glaze the mugs from time to time as needed. "I really didn't have any previous skill. It was tough for a little bit there, because I was getting it but I wasn't," Jordan explained. "They weren't perfect. It's been a challenge, but I feel like it's a good thing." More of Jordan's artwork can be found on his Instagram account.